I am so excited about today’s post. If you know me at all, you know I LOVE art! So when I walked into my daughter’s school and saw dozens of HUGE recreations of famous pieces of art painted by the students, I was so giddy. I only took photos of a few of the pieces of art, but there were literally dozens and dozens lining the walls. They were huge too – like, floor to ceiling huge. I should have taken a picture with my daughter next to one. I think they projected the images onto the paper and then each group got to paint theirs. Without further adieu, today is art appreciation day at House of Hepworths. Enjoy! We’ll start with my favorite piece of art – The Starry Night by Vincent Van Gough. I have loved this painting since I was a kid. 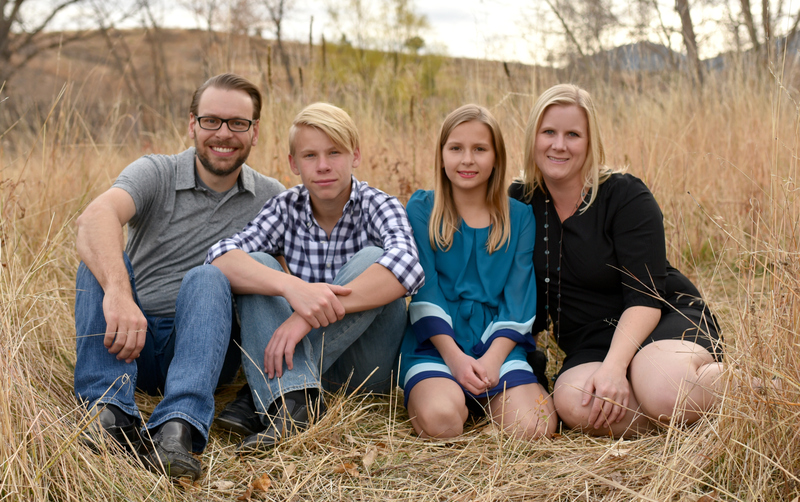 I remember once, when I was about 14, we took a vacation and ended up at an Observatory… McDonald Observatory maybe? Anyway, I bought a poster of The Starry Night and it hung in my room until I grew up and moved out. 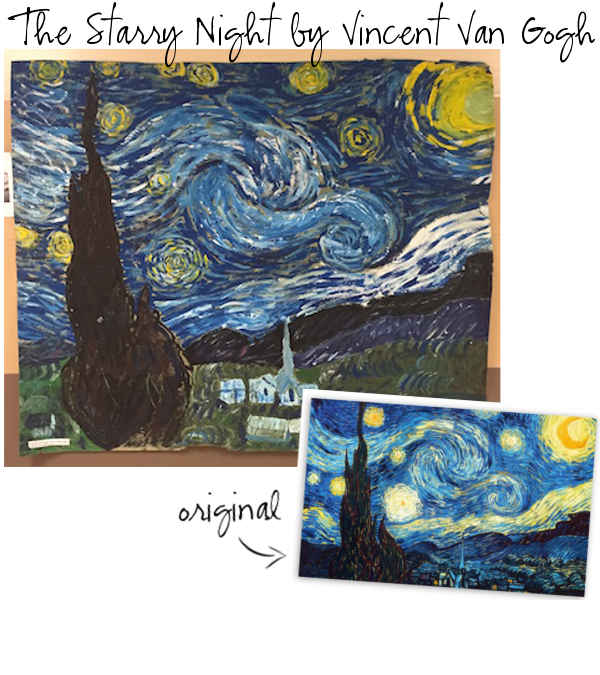 “The Starry Night was created by Dutch painter Vincent van Gogh. Painted in June 1889, it depicts the view from the east-facing window of his asylum room at Saint-Rémy-de-Provence, just before sunrise, with the addition of an idealized village. It has been in the permanent collection of the Museum of Modern Art in New York City since 1941, acquired through the Lillie P. Bliss Bequest. It is regarded as among Van Gogh’s finest works, and is one of the most recognized paintings in the history of Western culture. An American Classic, American Gothic by Grant Wood is one of the most recognized, copied, and widely parodied paintings in American pop culture. “American Gothic is a painting by Grant Wood in the collection of the Art Institute of Chicago. Wood’s inspiration came from the American Gothic House, and his decision to paint the house along with “the kind of people I fancied should live in that house.” Created in 1930, it depicts a farmer standing beside a woman that has been interpreted to be either his wife or his daughter. The figures were modeled by Wood’s sister, Nan Wood Graham, and Wood and Graham’s dentist, Dr. Byron McKeeby. The woman is dressed in a colonial print apron evoking 19th-century Americana, and the man is holding a pitchfork. The plants on the porch of the house are mother-in-law’s tongue and beefsteak begonia, which are the same plants as in Wood’s 1929 portrait of his mother, Woman with Plants. 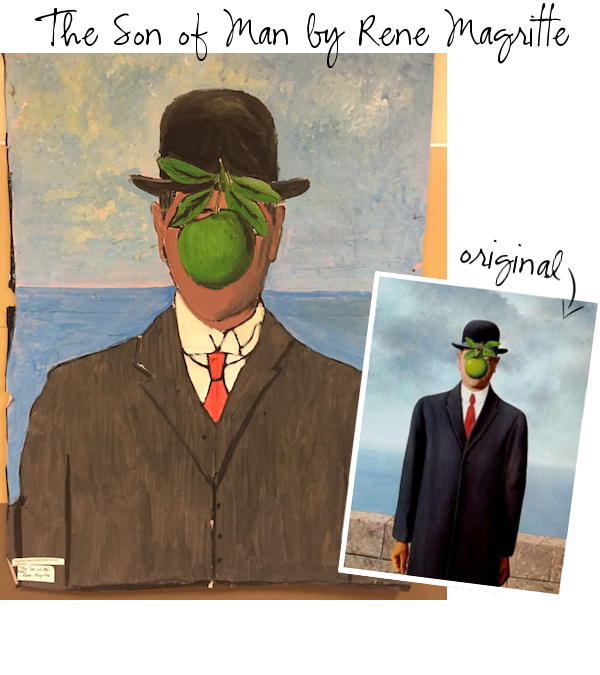 Here’s another piece you might recognize… The Son of Man by René Magritte is another classic. The Marilyn Diptych by American pop artist Andy Warhol is another favorite. I’ve loved Andy Warhol for as long as I can remember. 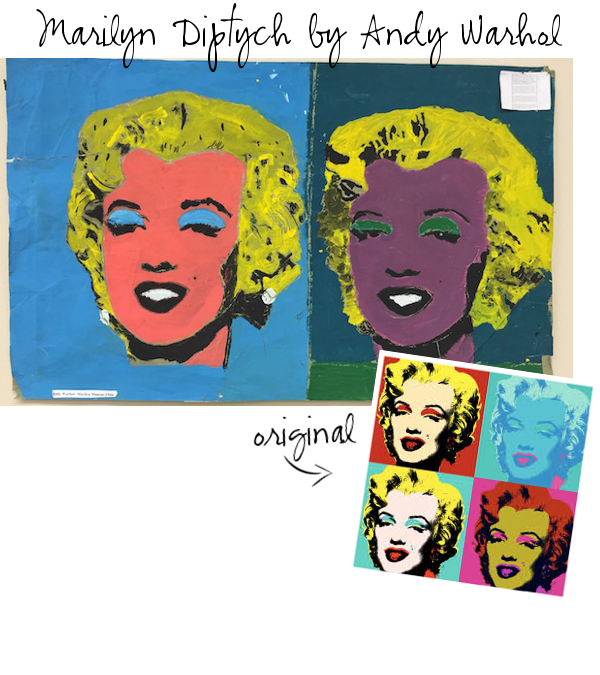 I even made my own Warhol inspired art several years ago. “The Marilyn Diptych was painted in 1962 and is a silkscreen painting. The piece is one of the artist’s most noted works, and it has been praised by several cultural critics. “The work was completed during the weeks after Marilyn Monroe’s death in August 1962. It contains fifty images of the actress, which are all based on a single publicity photograph. The diptych is actually fifty pictures; the left half are brightly colored, while the right half are in black and white. It has been suggested that the relation between the left side of the canvas and the right side of the canvas is evocative of the relation between the celebrity’s life and death. 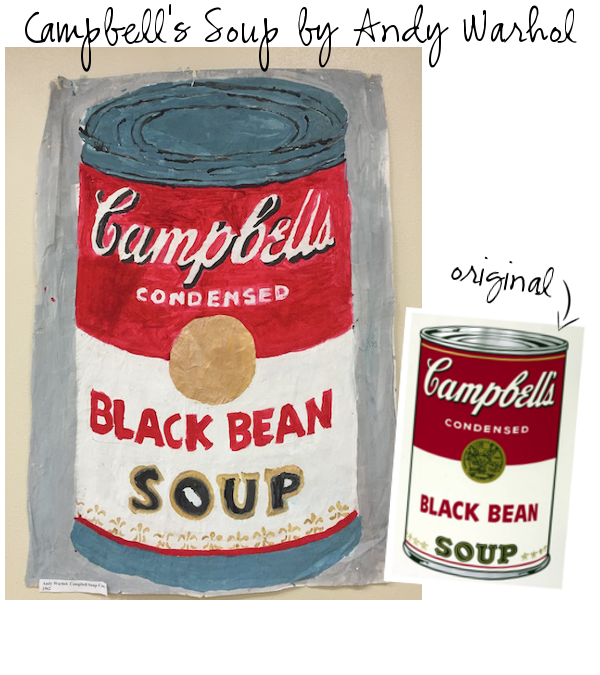 When you think of Andy Warhol, you probably immediately think of the Campbell’s Soup Cans. “Campbell’s Soup Cans, sometimes referred to as 32 Campbell’s Soup Cans, is a work of art produced in 1962 by Andy Warhol. It consists of thirty-two canvases, each measuring 20″ × 16”, and each consisting of a painting of a Campbell’s Soup can; one of each of the canned soup varieties the company offered at the time. Campbell’s Soup Cans’ reliance on themes from popular culture helped to usher in pop art as a major art movement in the United States. When I think of my teen years, I had exactly two artists who were my absolute favorite; Van Gogh and M.C. Escher. I was obsessed with M.C. Escher. I had a coffee table book of his work, a t-shirt, and also I would draw hands frequently. I felt so inspired by his mind-altering work. “Drawing Hands is a lithograph by the Dutch artist M. C. Escher first printed in January 1948. 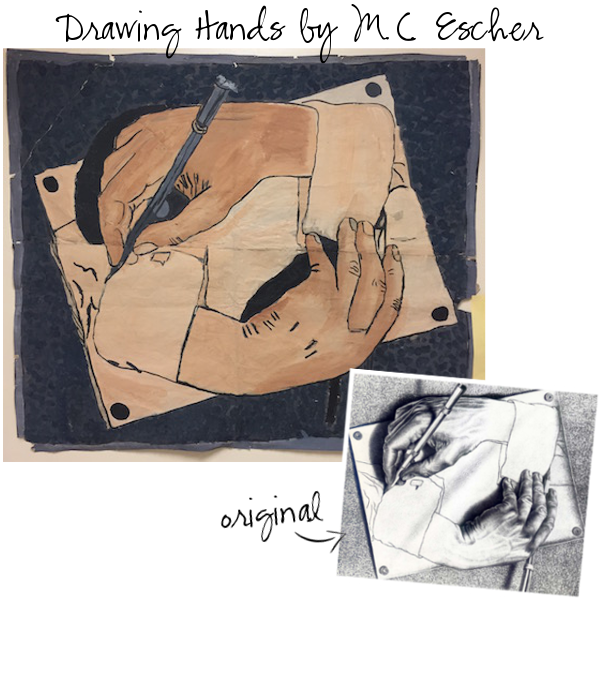 It depicts a sheet of paper out of which, from wrists that remain flat on the page, two hands rise, facing each other and in the paradoxical act of drawing one another into existence. Although Escher used paradoxes in his works often, this is one of the most obvious examples. When I saw two different M.C. Escher pieces of art depicted on the walls of the middle school, I think I let out an audible squeal. “Sky and Water I is a woodcut print first printed in June 1938. 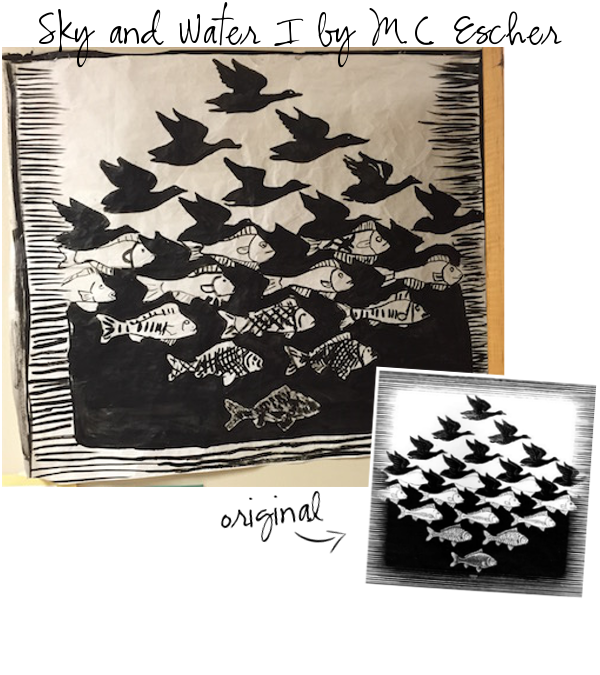 In this central layer of this piece, the elements are equal: birds and fish are alternately foreground or background, depending on whether the eye concentrates on light or dark elements. 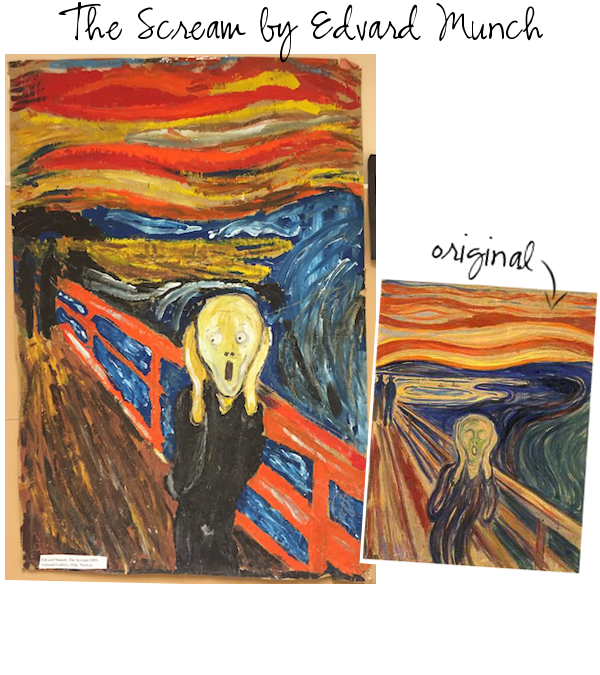 If you’ve been in any type of chachki art store, you’ve probably seen some variation of The Scream by Edvard Munch. “There are four versions of The Scream; two painted and pastel versions. One of the four was sold for $119,922,600 at Sotheby’s Impressionist and Modern Art auction on May 2, 2012 to financier Leon Black, the fourth highest nominal price paid for a painting at auction. You might recognize Gustav Klimt by his even more popular piece, The Kiss, although The Lady in Gold is also quite famous. “Portrait of Adele Bloch-Bauer I (also called The Lady in Gold or The Woman in Gold) is a painting by Gustav Klimt, completed between 1903 and 1907. The portrait was commissioned by the sitter’s husband, Ferdinand Bloch-Bauer (de), a Jewish banker and sugar producer. The painting was stolen by the Nazis in 1941 and displayed at the Österreichische Galerie Belvedere. In 2006, following eight years of effort by the Bloch-Bauer heirs, the painting was returned to the family; it was sold the same year for $135 million, at the time a record price for a painting. 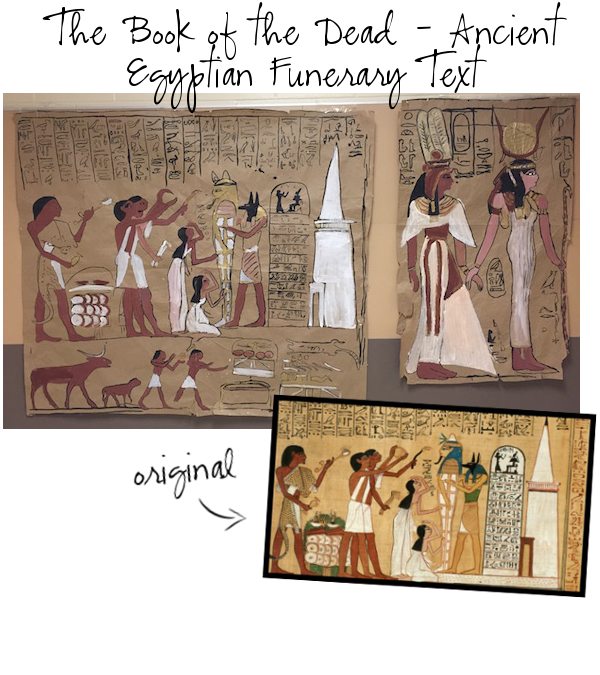 Last on our artwork tour, The Book of the Dead is an ancient Egyptian funerary text, based on the Papyrus of Ani. It was created c. 1250 BCE, in the 19th dynasty of the New Kingdom of ancient Egypt. I hope you enjoyed your Art Appreciation Tour today! I wish I could have taken one of these huge paintings done by these kids home with me. They were so so so cool! Do you have any specific favorite pieces of art? What piece, and why? What a great post today. I so enjoyed all the art information. Thank you. <3 I'm glad you liked it! I loved writing it. So interesting to hear some history about each piece. 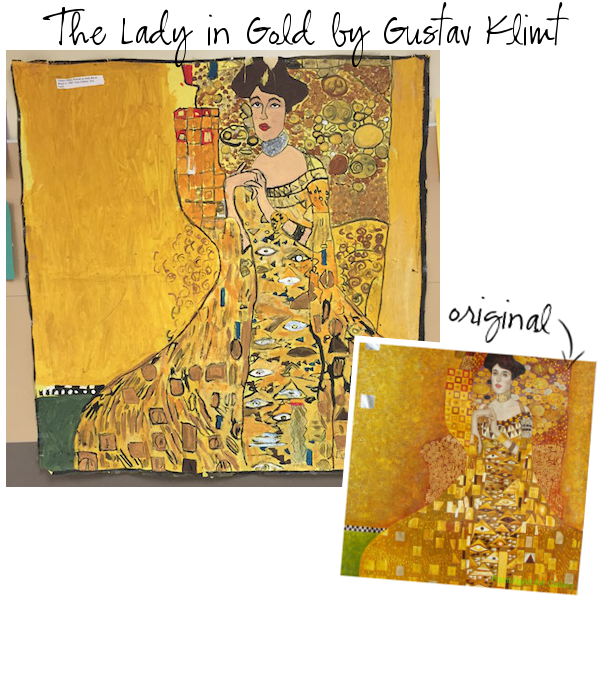 Have you seen the movie Woman in Gold about the Klimt painting? It stars Helen Mirren and Ryan Reynolds. It was amazing to watch all they had to go through to get the painting back. I have not, but now I’m going to! Thanks for the recommendation! 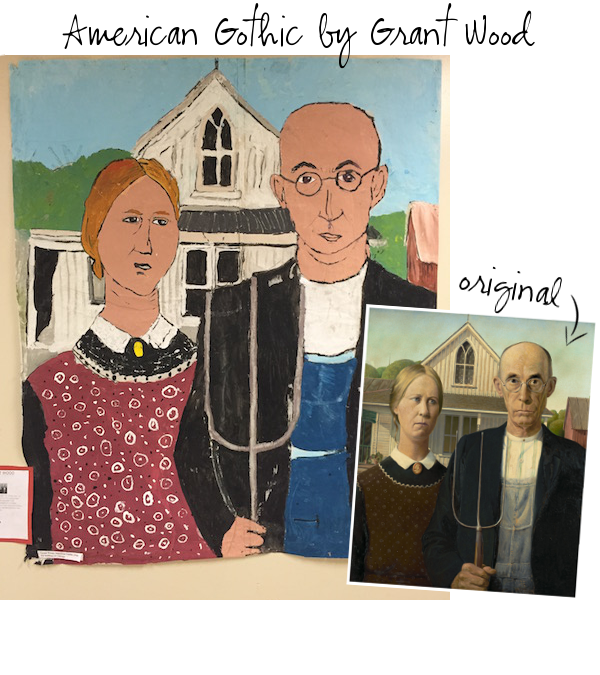 The elementary school does an art show every year and among featuring the student’s artwork, there are reproductions of some of these famous paintings. Some like The Scream and The Mona Lisa, have the faces cut out so you can insert your own face and take a picture. Love that they are learning about all different types of art. That is so fun! I love that the schools are teaching art appreciation to children. I hope they never cut those programs.